This book identifies the 7 habits that most differentiate high performance from low performance organisations. It is based on ground-breaking research involving the views of over 100,000 employees from around 200 companies. 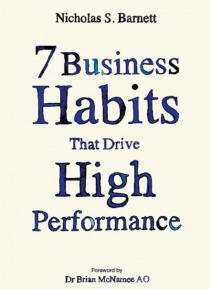 The 7 Business Habits are all inter-related and indispensable to the delivery of sustainable high performance. Adopting and sustaining the 7 Business Habits in the ways set o… ut in this book will significantly improve your organisation's performance. There will also be numerous side benefits, including making your organisation a better place to work, improving employee engagement and retention, customer loyalty and advocacy, productivity, innovation, organisational resilience and change capability. All of these factors are also inter-related and build on each other to increase your performance even further. The 7 Business Habits apply to all types and sizes of organisations, including public, private, government and not-for-profit entities.